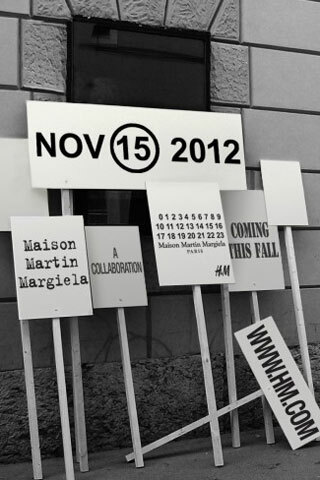 Yesterday H&M announced another designer collabo and this fall we should expect a collection from MAISON MARTIN MARGIELA. MAISON MARTIN MARGIELA is a French fashion house which has always followed its own path, often outside the conventional fashion framework. The range – which will comprise men’s and women’s ready-to-wear, as well as accessories – will launch in 230 stores worldwide and online on November 15. “Maison Martin Margiela is one of the most important and influential fashion houses of the past three decades,” said H&M creative advisor Margareta van den Bosch. “I am so excited by this radical collaboration which will give fashion lovers around the world the chance to wear special pieces by Maison Martin Margiela. This collaboration will be a great and memorable fashion moment.” Michelle Obama has been known to rock Margiela, while Kanye West helped the brand enter the luxury rap lexicon (and thus mainstream consciousness) via Watch the Throne. Other labels to have teamed up with H&M include Versace, Marni, Lanvin, Karl Lagerfeld and Stella McCartney.